We’re on Day 9 of 31 Days of Five Minute Free Writes in the month of October! Click here to visit the blogs of other people who are participating in the challenge. It’s a hard, hard thing to trust in the Lord. It’s not a question of whether or not He is trustworthy. As believers, we know that He is. Then why is it so hard to trust? For me, it’s a daily fight. Trust is battlefield of the mind. Even when we long to lean with full confidence into the Lord’s goodness and provision, we’re assaulted every hour with an onslaught of enemies — outward and inward. We fight the internal voices of fear and doubt when the rubber hits the road. We need to saturate ourselves with the Word. When it’s a battle of voices, we need to make sure God’s is the loudest and strongest in our minds. I loved your “Jungle Book” reference. Serpents asking us to trust in them is not a benign reference, truly. There is a meaning behind there, I am certain. Mr. Kipling was intentional with his villains. Although, when it comes to large cats, I prefer C.S. Lewis’ hero to Bagheera. Thank you, this was a delightful prompt this week! God used trust as my 2014 one word and led me to truly trust Him. Somewhere, somehow, it happened that year. Amen! I love my Bible app, because it’s so much easier to saturate myself in the promises of the One I trust! It is very hard to trust even though that is all God asks us to do. I have been pointed toward memorizing scripture everywhere I turn recently. I think this is a hint from God. I have been working on it. Good to see you Kate! Hope you are well and you have a wonderful weekend. I trust God; aside from not having much choice(!) it’s what I choose to do. Let the Word win! Amen! 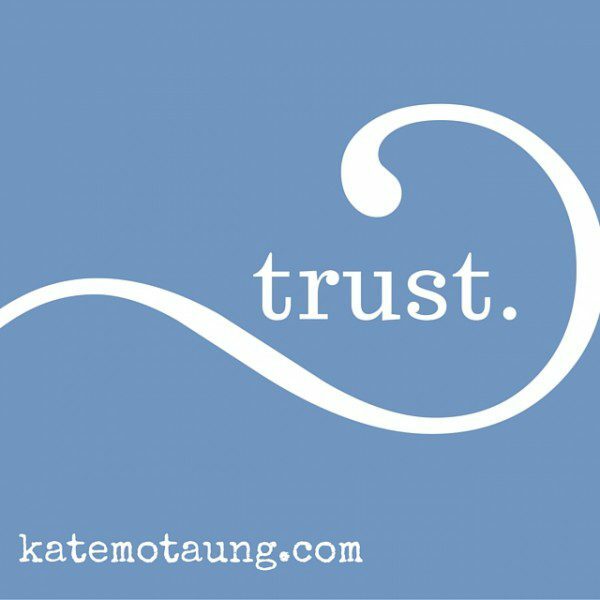 Kate, the first words to come into my head when I read the prompt were … “Some trust in chariots…” but then it didn’t fit into my challenge this month 🙂 In a time when so many voices are clamoring for us to trust them, may we trust the One who is always trustworthy. Grateful to have stopped here this morning! I went to the pre-party last night! I am sitting out of FMF while #write31days continue. Be back November 6th though!!! Such a good word! Yes, I have found myself that my faith falter when I am not focused on the promise of His word and instead trying to find the answers myself. We find our strength when we look to Him. Thanks for these encouraging words! yes, yes, and YES! it’s such perfect timing as i’ve just sent my firstborn to college, and between that and some shuffling within our family of believers locally, i’ve been sent into a new season of learning to trust. so thankful for your faithfulness, and the challenge to keep writing. I decided to join in on FMF today, because I’m stuck on my blog and I miss FMF!! Thanks for a great word prompt.